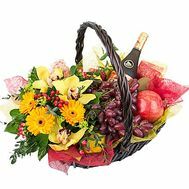 Gift baskets are an original gift for those who are tired of simple bouquets and want to give their loved ones something more. 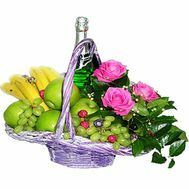 This kind of gift became popular recently, and therefore it is pleasant and easy to give them - the recipient will not exactly expect you to do so. 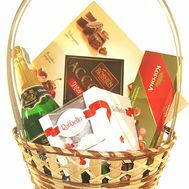 And what can be more pleasant than a beautifully decorated, decorated, made with taste and love gift basket? 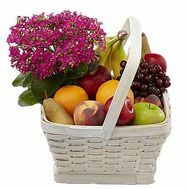 Each basket in our store is special, unique, and each can be used in the life of your loved ones and loved ones. 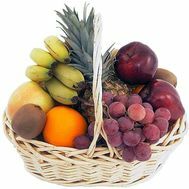 In our online store you can find and buy a large number of baskets that will be useful to you for all occasions. 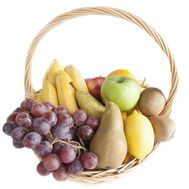 So, let's consider what they are and what we can offer you. 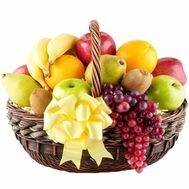 A bright, juicy fruit gift is useful to you in any situation. 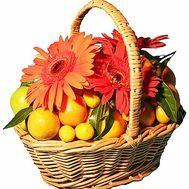 A beautiful, wicker basket filled to the brim with the freshest and sweetest fruits will cause a lot of pleasant emotions, a smile on your face and will simply become a useful gift. 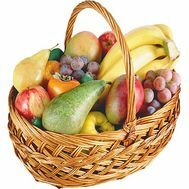 Its content can be very different: it can be ordinary, familiar fruits for us, or a distant exotic, which you have long dreamed of seeing and tasteing. 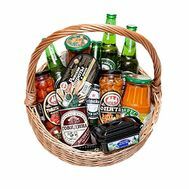 Such presenters will perfectly fit into the corporate atmosphere or a family holiday. 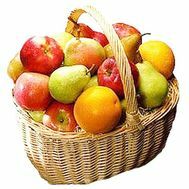 You can buy a fruit basket all year round and on any holiday. 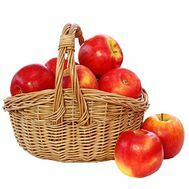 The most popular and best selling in our store. 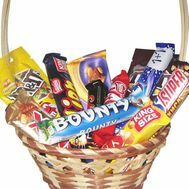 And it's not surprising, because sweet in Ukraine is a great variety, and the number of different sweets and brands - even more! 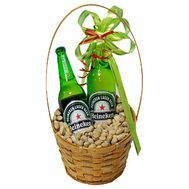 Filling such a gift can be very different at your discretion. 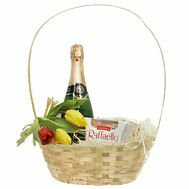 So, it can be a children's basket with chocolates or chocolate bars, or a beautiful, romantic gift, full of sweets, cakes and much more for your beloved girl. 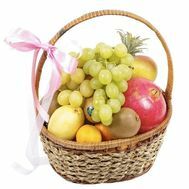 All sweets are selected individually for each basket, and therefore this gift will be remembered not only by sight, but also by its taste. 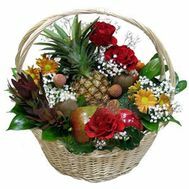 You can buy sweets both separately and as an addition to flowers. 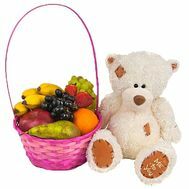 No less popular than sweets. 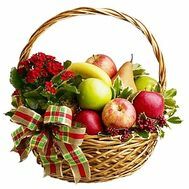 They are an excellent, family gift for the celebrations, when there is absolutely no time to run for food. 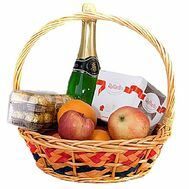 Just such a gift is perfect for congratulating with his help his superiors on the anniversary, or their beloved grandmother and grandfather on New Year's holidays. 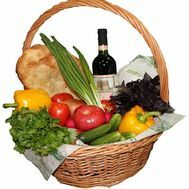 Products for the basket are always selected the freshest and necessary for each person. 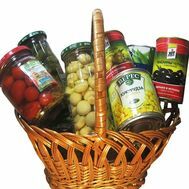 Buy and give a gift basket of food will be very handy during the New Year holidays or your beloved mother or grandmother. 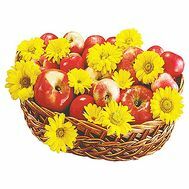 Colorful, unusual, they are full of the most vivid impressions. 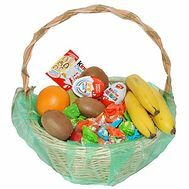 Egg Kinder surprise is not only the most favorite childish sweetness, but also the dream of many girls and even women. 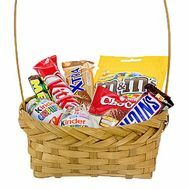 After all, it's no secret that chocolate in this sweet is the best and the most delicious. 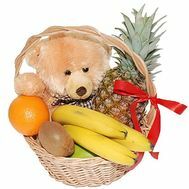 Because such gifts are usually given to the beloved girls, sweet tooth, or to small children - their own or a tribe, because they will cause them the most joy and happiness. 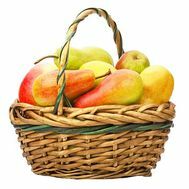 Strict, conservative, they can have a very different content. 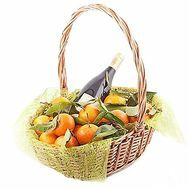 It can be a fruit or food basket, which will be supplemented with a bottle of branded alcohol. 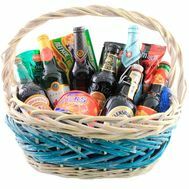 Or it will contain only alcoholic beverages of different brands and species. 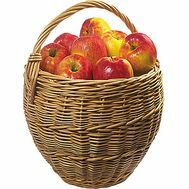 Such baskets are given to beloved men and leaders on round dates, anniversaries or just so that to surprise beloved man. 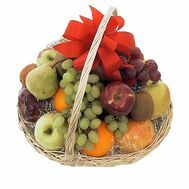 A beautiful combination of fresh fruits and flowers makes this gift special and unforgettable. 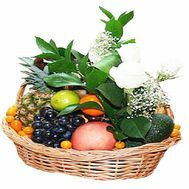 Our florists carefully select not only the basket itself for filling, but also fresh, sweet fruits, as well as the color range of flower buds. 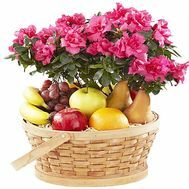 Such universal gifts can be given to any person: as a friend on his birthday, or as a member of the family, as a thanks or support. 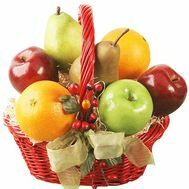 Basket with your favorite filling is an unusual and unusual gift. 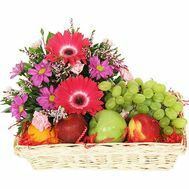 It evokes delight from any recipient, and therefore to give her - the pleasure! 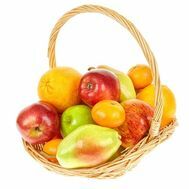 We have more than 10 years in the service sector and the number of our customers has long exceeded 40,000. 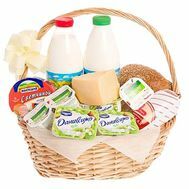 This shows that already many thousands of Ukrainian families have tested our quality service, making sure of its reliability, convenience and democratic prices. 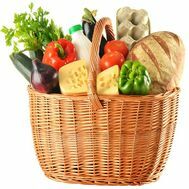 Why buy a food basket is it with us? 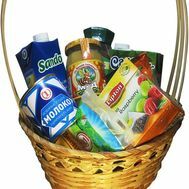 Because we give a 100% guarantee of the quality of the products that will be included in each set. 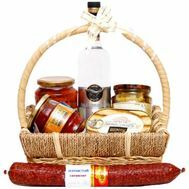 We use only fresh products, and our experienced workers will choose them in the best shops of Ukraine. 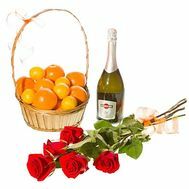 Thanks to this, our reputation is always on top: we are happy to serve our customers at the highest level in any situation. 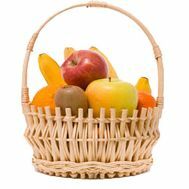 Our delivery service always works for you: on any day our couriers will promptly deliver the basket you purchased to the required threshold. 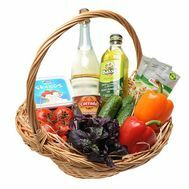 You can also take part in our promotions, get discounts, and get acquainted with customer feedback before you become a part of our big and happy family.